For the kids at home their toys are their loving world and they ask for more and more no matter how they have already. And in the love of the kids parents also don’t hesitate to buy them every new and interesting toy adding a lot to the existing huge toys collection. And on the birthdays the kids are gain loaded with the toy gifts from their dear ones as result they have lots of toys in their room which are sometimes hard to store and organize. 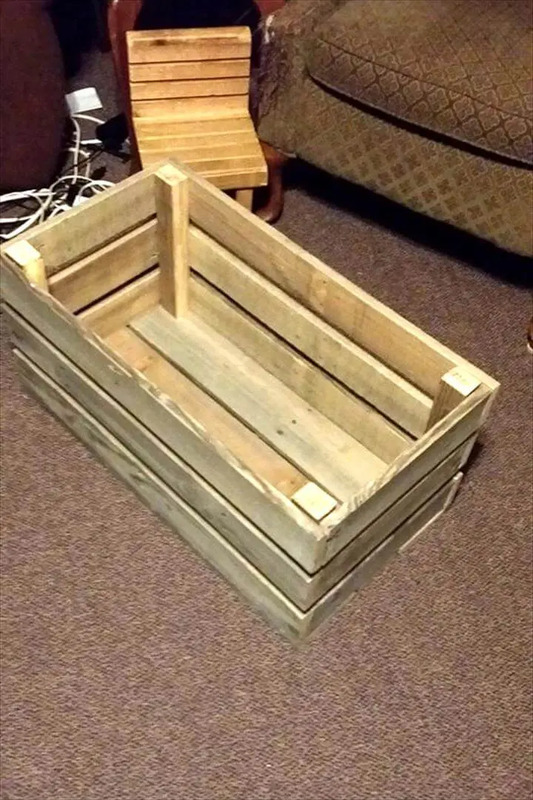 If you are also facing the same problem then this DIY pallet toy box is the ultimate functional solution being capable to hold and house a lot of toys in it. 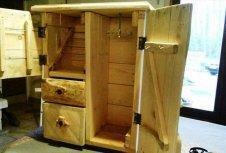 And being made from the pallets it would be not only cost free but extremely easy to install at home too. Only the pallet slat pieces have been first sawed and then stacked in layers to form this rectangular shaped box. The rustic brown finish of the box would really jazz the room decor either modern or traditional type. 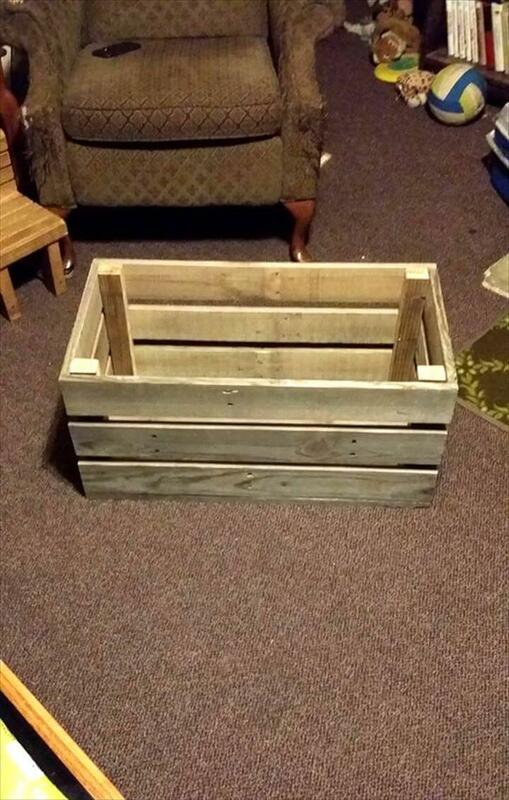 Wooden boxes are always of great functional value when you have a loads of the things to sore like the toys and the tool and now you can make such storage box free of cost and of your own using the recycled pallets. 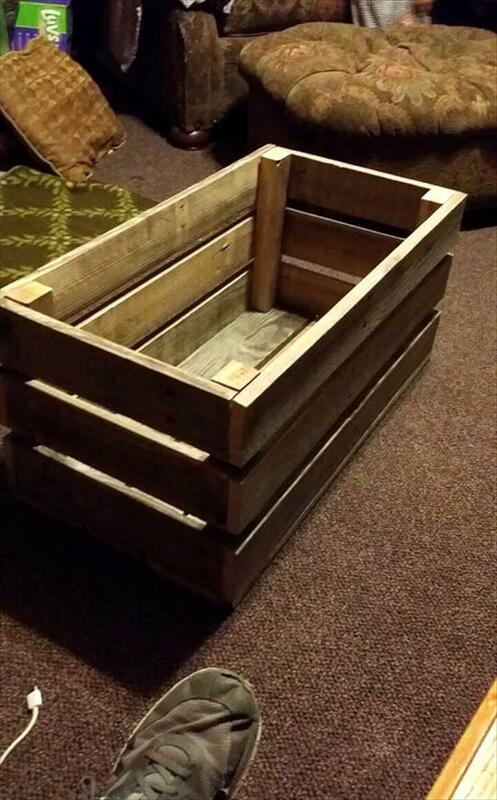 This storage box for the housing of the kid’s toys has been very easily made from the pallet slat pieces having been sawed from the skids and have been stacked to each other in three layers to shape up this rectangular shape box. The toy box look really a rustic piece in its unfinished attire and you can make it stained in the matching colors of the kid’s room so that it looks an invincible piece of the kids room decor and the furniture range.